Please join President Smart and Provost Einhellig on Sept. 25 for their annual campus talk. Clif Smart and Frank Einhellig will present the State of the University address at 12:15 p.m. Monday, Sept. 25, 2017, in the Plaster Student Union theater. The speech will be live streamed. For those who cannot attend in person, the speech will air at 7 p.m. Sept. 25 on KSMU and 7 p.m. Oct. 2 on Ozarks Public Television. * You need Adobe Reader to access this file. Clifton "Clif" M. Smart III has served as the 11th president of Missouri State University since June 27, 2011. 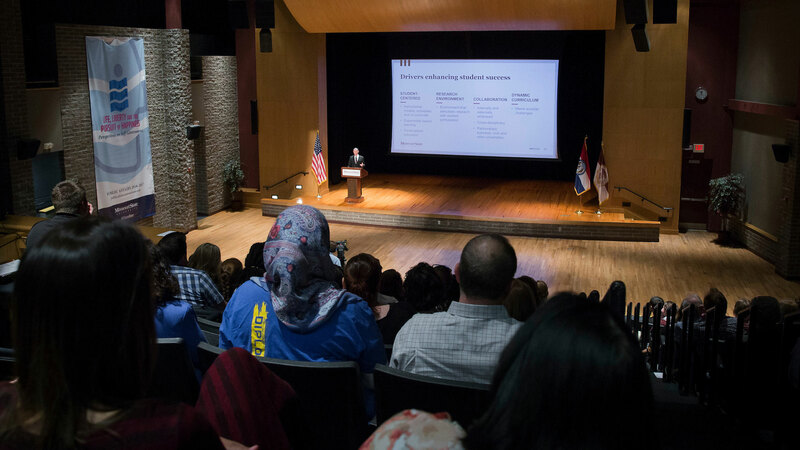 Smart is known throughout campus and the state of Missouri for his collaborative leadership and strong relationships with students, faculty and staff. During his tenure, the university has continually set new enrollment records, added degree programs and constructed or extensively renovated more than a dozen major campus facilities. Before his presidency, Smart served as the Missouri State University’s general counsel.